Spacetime Studios is celebrating the success of its MMORPG Arcane Legends with the release of an infographic, detailing the game’s highlights over the past two years. In addition, the company has announced the launch of the game on the Amazon Appstore, with this new version joining releases on iOS, Google Play and the Chrome Web Store for PC and Mac. In Arcane Legends, players create a character (a warrior, rogue or sorcerer), choose a companion pet, and then enter into the persistent world of Arlor on a quest to defend the world from evil forces. Since the game’s launch, over 140 million hours of the game have been experienced by gamers. In terms of in-game content, users have killed over 7.5 billion enemies, and have owned more than 27.5 million individual pets. Users have completed over 200 million individual quests. A full look at the game’s stats can be found in the infographic at the bottom of this post (click for larger). 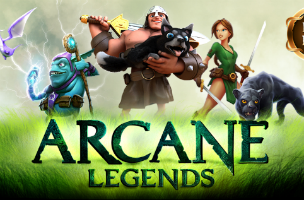 Arcane Legends is available to download for free on the Amazon Appstore, the iTunes App Store, Google Play, and the Chrome Web Store.